Thanks for agreeing to the interview! First, just wanted to say thank you for your contributions to THE WORLD OF ICE AND FIRE. The team from Beckett-Mayer really put together a terrific group of artists, and your work really stood out. 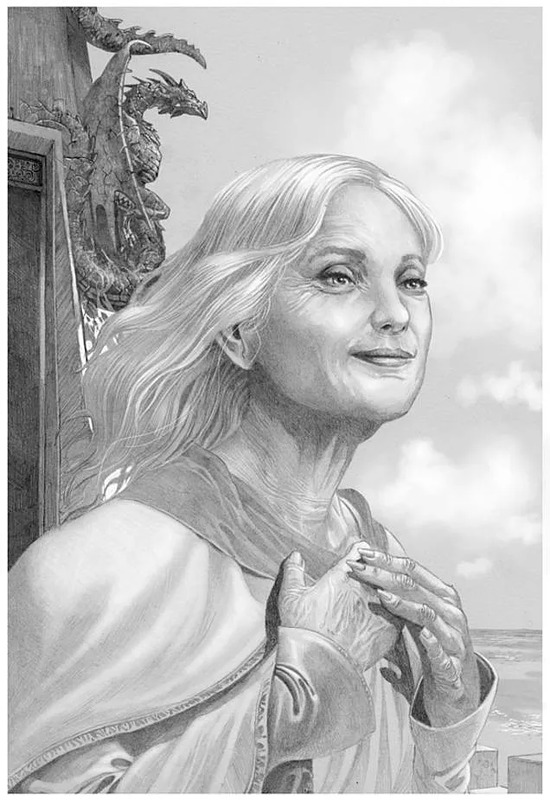 Your child of the forest wowed us back then, and we’re glad this has led to your involvement in FIRE AND BLOOD. DW: Thank you very much! It is my pleasure. I was absolutely thrilled to be part of the team on both books and am grateful to have had the opportunity. You’re largely self-taught, and have worked on a lot of STAR WARS related projects and comics. Was there a big break that helped you get a foothold as an artist and illustrator? Yes, Bobbie Chase, an editor at Marvel comics assigned me the penciling duties on a monthly series called “Blade the Vampire Hunter”. I gained a lot of experience on that book over the year that I was illustrating it. I believe this experience gave me the tools that I needed to continue on as an illustrator. Which artists have most influenced you in your work? DW: The work by Fortunino Matania, a truly extraordinary artist. Frank Frazetta, my hero since high school. John Singer Sargent, John William Waterhouse, Alphonse Mucha, Alan Lee…..this list is long! Lol! But these remain my major influencers. 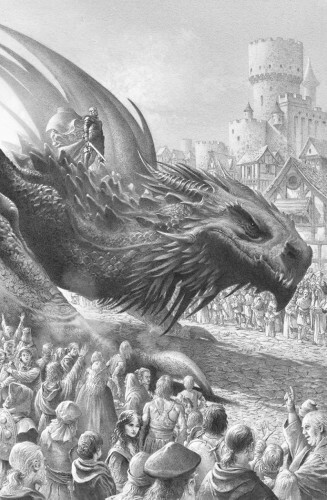 How familiar were you with A SONG OF ICE AND FIRE or GAME OF THRONES before you were brought on board FIRE AND BLOOD? I was then and continue to be a huge fan of the books and the HBO series. What was the process of deciding which scenes to depict in F&B? Was there any one particular moment or character or event that you really caught your imagination? DW: I read the manuscript once, just to enjoy and get a feel for the overall tone of George’s work in this book. On the second read, I broke the manuscript down to ten page segments with the idea that we would choose one scene to illustrate per segment. I chose two scenes per segment (a first and second choice if you will). I was completely overwhelmed with all of the “inspiring” images. The book was so rich with characters and story, it was hard to know where to start. I realized that I had to approach my “wish list” from the point of what was the most important image in that ten page segment. It wasn’t always the one I wanted to draw the most, but the one I felt was the most complimentary to the story George was telling. 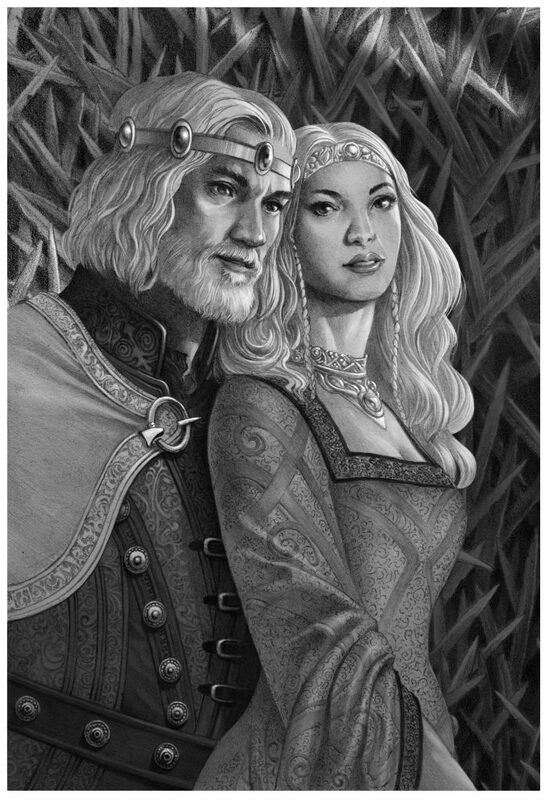 One of many images that I recall grabbing me was the second wedding of Jaehaerys and Alysanne at King’s Landing. I remember reading that scene and just thinking this is an absolute must. I sent them in and crossed my fingers. I also had some specific suggestions and selections from George to work on right away. We do know that George made some suggestions along the way regarding scenes he’d like to see depicted, but one in particular stood out: he suggested Gyldayn get a portrait as well. What directions did he have? George recently revealed one of your pieces, depicting King Jaehaerys and Queen Alysanne. We know that there’s actually two different paired portraits, showing them at different ages. Are there some rules of thumb that you use to try and make a younger version of a character look like the older version (or vice versa)? DW: The eyes, mouth and shape of the face; meaning the cheek and jawline must remain the same between young and old versions of the character in the basic construction. The nose will widen when aging takes place so I will usually draw that in first. When the construction is complete, I stretch and pull the features until the character is aged appropriately based on reference of the age group. One basic rule is the face will narrow, becoming slightly longer and more angular with age, it all about adding and taking away fat until it looks right. 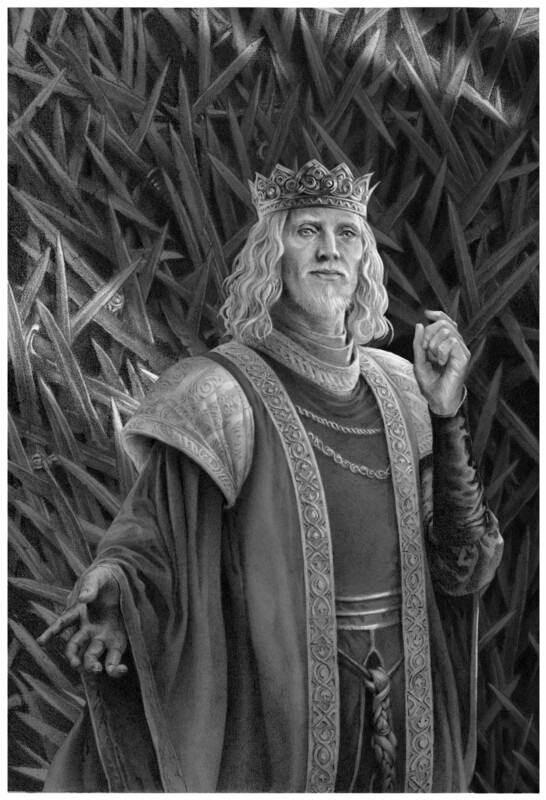 You’ve done portraits for the kings (and the occasional queen), among them Aenys I. He’s quite a contrast from both his father and his half-brother, according to the text, and your portrait really captures that. How did you go about conveying the character through your illustration? 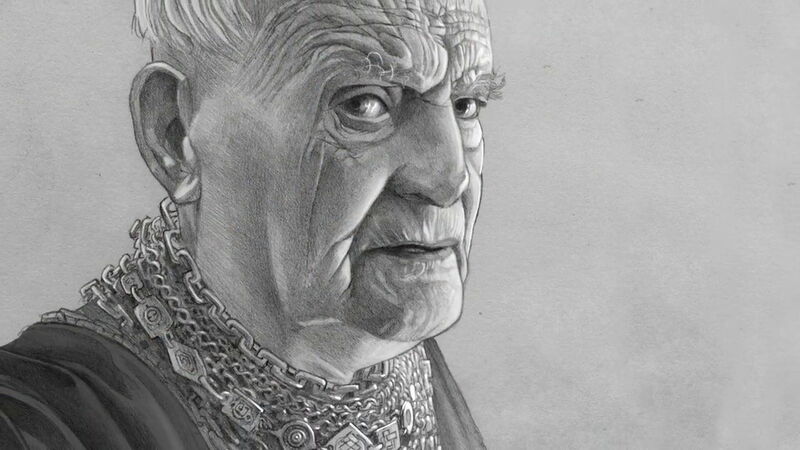 DW: When it came to the portraits of most of the kings and queens I was asked to reference illustrations previously drawn by the artist Amok, and use them as a jumping off point. So that is where I started. As I understood George’s description of the character, Aenys seemed to be more of a “benefactor” than a “Heir”. He used all of the resources left by his father to explore his interests and improve himself. His characteristics included wanting to please everyone and being indecisive. I thought to approach these attributes through his pose, one hand up, one hand down, one hand open, one closed. Sadness in his eyes, a smile on his lips, at the same time I made an effort to make him seem charming and approachable. Finally, were there any particularly difficult or time-consuming pieces in this book? DW: No matter how long I’ve worked in this industry, I can still get intimidated by an assignment. Working on Fire & Blood with George R. R. Martin is one of those projects. I am deeply inspired by his writing and a huge fan of the work; and like anyone given this kind of opportunity, you want to make the editors and the author happy. 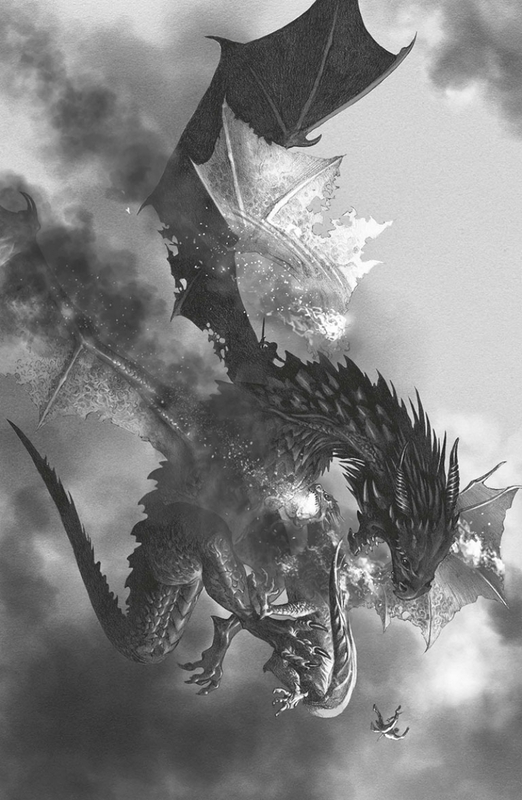 So for me, it was the first illustration that I needed to get through and that was King Aegon I on Balerion the Black Dread. Thanks again for your time, Doug. DW: Thanks for the opportunity, your questions were excellent and I really appreciate the interview.